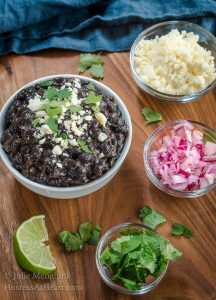 Black beans are traditionally served with Mexican cuisine. Some of it is full of flavor and some of it is like flavorless mush. 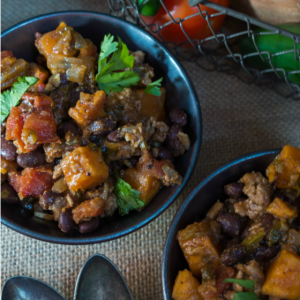 This Black Bean Recipe is quick, easy, and delicious. When I was younger, unlike most kids I wasn’t a picky eater. There wasn’t much that I didn’t like. One of the exceptions was black beans. 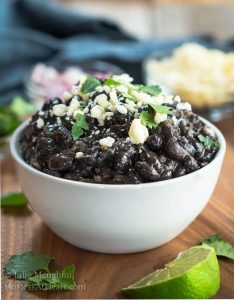 Black beans were not something that we ate a lot of and the only time that I had them were at a friends house. My experience wasn’t a good one. You know when you’re taught to be polite and to eat everything on your plate but you’d rather not! As I got older, I would give them a try when we ate out at Mexican restaurants. I learned that no two black bean recipes are alike, or created equal in the flavor department. To me, what makes a great black bean recipe is a thick sauce with some of the black beans kept whole. I don’t want a soupy mess that just runs into everything else on the plate or that is as thick as wallpaper paste. And I want flavor. A lot of time it’s as if the beans are kept on the stove all day long and loose their consistency as well as any flavor they once had. I don’t reserve this dish just for when we make Mexican dishes. 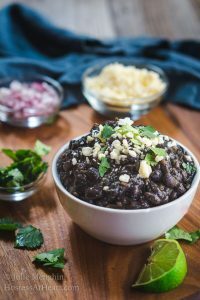 Black beans are a great source of protein. They are delicious as a vegetarian dish or as a side to any cuisine. This recipe has no added fat. Many restaurants add lard or other animal fats to their black bean dishes. 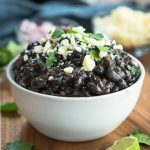 Quick and Easy Black Bean Recipe skimps on time but never on flavor. They're restaurant quality at home! Combine black beans, green chilies, onion, jalapeño, garlic, cayenne, cumin and ancho chili powder together. Bring to a simmer and heat through for approximately 10 minutes or until onion and jalapeño begin to soften. Salt and pepper to taste. Stir in cilantro and spritz with fresh lime. Garnish with fresh Cotija cheese if desired. This recipe is quick, easy and delicious, a homerun in my book. You are definitely going to want to try it, and I think it will become a regular in your kitchen like it has mine! 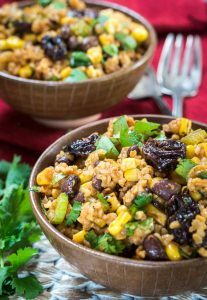 If you are looking for other great ways to serve black beans, here are some of my very favorite recipes! Thank you Loretta! I have some friends coming over for a little Cinco de Mayo and these beans will be part of it. A margarita and a little salsa music are all we need! Oh! I at first thought you were using dried black beans so I was confused! This looks great, and it certainly saves on time! Thank you, Mimi! This solves my problem when I forget to plan ahead with the dried beans. I love the new look of your blog and the photos are awesome!!! I want to lick the screen. LOL!!! Thank you so much, Liz! That is so sweet of you. My family loves black beans and I always have few cans in pantry. Love how you spiced up your recipe! Thank you, Sonal! No boring beans right? Thank you Elaine! I agree on that big ole fat bean love. Thank you for hosting FF this week too! I’d LOVE that Bobbi. We would have us a great ole time! I’m getting out my shaker just in case yu make it over! I.m glad to see that you use canned black beans because I do as well. I love black beans and can eat them straight out of the can. This recipe is delicious and is so quick and simple. Love it Julie. 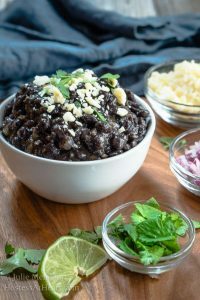 I love black beans–and always have! 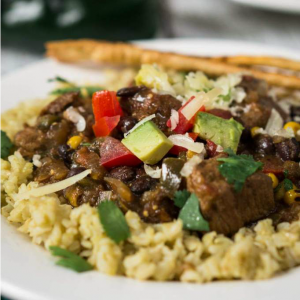 But you’re so right; not all black bean recipes were created equal :). These look so delicious with all the spices. I can’t wait to try them!